Levi ben Gerson and Alexander. Greek commentator on Aristotle; flourished at the end of the second century and at the beginning of the third, in the reign of the emperors Septimus Severus and Caracalla. He was surnamed "the Exegete" and "Aphrodisiensis"; the latter designation being derived from his birthplace, Aphrodisias in Caria. His authority was equally high among the Arabians and the Greeks; and Maimonides, in a letter to Ibn Tibbon, the Hebrew translator of his "Guide to the Perplexed," especially recommends to him the study of the commentaries of Alexander ("Letters and Responsa of Maimonides," ed. Leipsic, p. 27). Besides the commentaries, which for the most part have been translated into Arabic, Syriac, and Hebrew—the latter version has been of service in the reconstruction of the Greek text—Alexander paraphrased Aristotle's book on "The Soul." In this work, Alexander evolves a new theory of intellect, which theory was the subject of much controversy between the Mohammedan and Jewish philosophers. According to Alexander, intellect (νοῦς) in its primitive state is nothing but an aptitude associated with the other faculties of the soul, the formative principle of the organism. This primitive intellect, which has only a potential existence, is called νοῦς ὑλικὸς (the material intellect), because, like matter, it is capable by development of transformation and of assuming a distinctive form. In fact, this faculty passes from a potentiality into an actuality, and commences to have an effective existence when, by study and reflection, it acquires ideas, with which it identifies itself; for the act ofthinking can not be separated from the object of the thought. This new intellect, which is, accordingly, the primitive intellect recast by experience, is called the acquired intellect ( ). But what is the motive force that causes the material intellect to pass from a potentiality into an actuality? It is the universal spirit, which, indeed, is God Himself. But as the relation between the soul and God is only temporary, this intervention, this illumination by the Divinity, ceases at death; and the acquired intellect relapses into nothingness. This system of psychology naturally aroused the strongest opposition on the part of the Arabian and Jewish philosophers, who, moved by sentiments of religion, sought to deaden the blows struck at the fundamental dogma of Islamism and Judaism: the immortality of the soul. Averroes (Ibn Roshd), in his treatise on the intellect, enunciates the opinion that the human intellect, so long as it is in the body, is virtually nothing but a potentiality, a mere capability, but that it becomes an intelligent agent, an actual substance, as soon as it relinquishes the body. 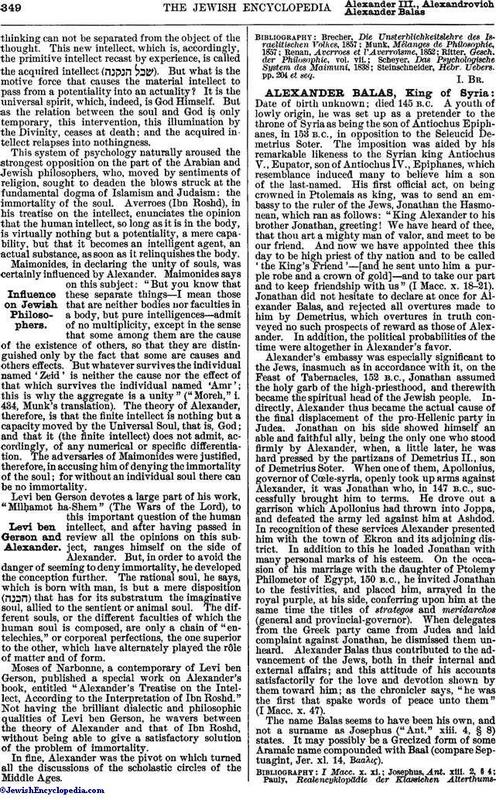 Maimonides, in declaring the unity of souls, was certainly influenced by Alexander. Maimonides says on this subject: "But you know that these separate things—I mean those that are neither bodies nor faculties in a body, but pure intelligences—admit of no multiplicity, except in the sense that some among them are the cause of the existence of others, so that they are distinguished only by the fact that some are causes and others effects. But whatever survives the individual named 'Zeid' is neither the cause nor the effect of that which survives the individual named 'Amr'; this is why the aggregate is a unity" ("Moreh," i. 434, Munk's translation). The theory of Alexander, therefore, is that the finite intellect is nothing but a capacity moved by the Universal Soul, that is, God; and that it (the finite intellect) does not admit, accordingly, of any numerical or specific differentiation. The adversaries of Maimonides were justified, therefore, in accusing him of denying the immortality of the soul; for without an individual soul there can be no immortality. Levi ben Gerson devotes a large part of his work, "Milḥamot ha-Shem" (The Wars of the Lord), to this important question of the human intellect, and after having passed in review all the opinions on this subject, ranges himself on the side of Alexander. But, in order to avoid the danger of seeming to deny immortality, he developed the conception further. The rational soul, he says, which is born with man, is but a mere disposition ( ) that has for its substratum the imaginative soul, allied to the sentient or animal soul. The different souls, or the different faculties of which the human soul is composed, are only a chain of "entelechies," or corporeal perfections, the one superior to the other, which have alternately played the rôle of matter and of form. 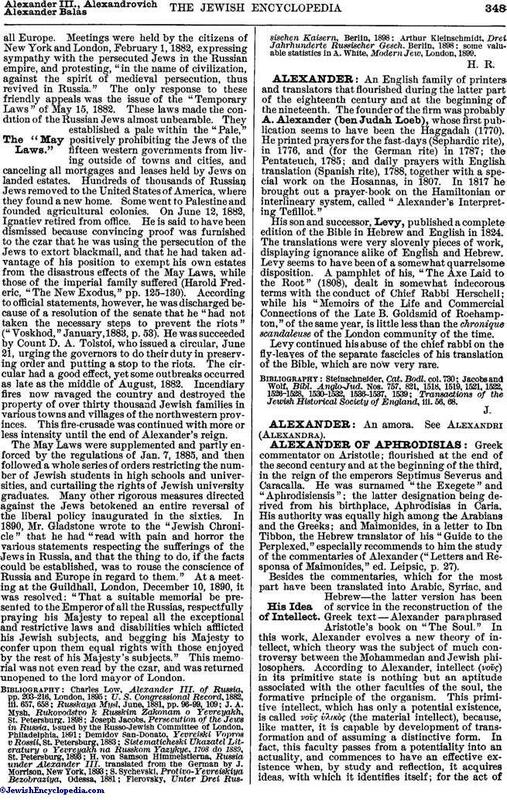 Moses of Narbonne, a contemporary of Levi ben Gerson, published a special work on Alexander's book, entitled "Alexander's Treatise on the Intellect, According to the Interpretation of Ibn Roshd." Not having the brilliant dialectic and philosophic qualities of Levi ben Gerson, he wavers between the theory of Alexander and that of Ibn Roshd, without being able to give a satisfactory solution of the problem of immortality. In fine, Alexander was the pivot on which turned all the discussions of the scholastic circles of the Middle Ages. Steinschneider, Hebr. Uebers. pp. 204 et seq.